Stock Mouthguards may be purchased from a sporting goods store or pharmacy. They are made of rubber, polyvinyl chloride, or a polyvinyl acetate copolymer. This mouthguard is relatively inexpensive, but the disadvantages far outweigh the advantages. They are available only in limited sizes, do not fit very well, inhibit speech and breathing, and require the jaws to be closed to hold the mouthguard in place. 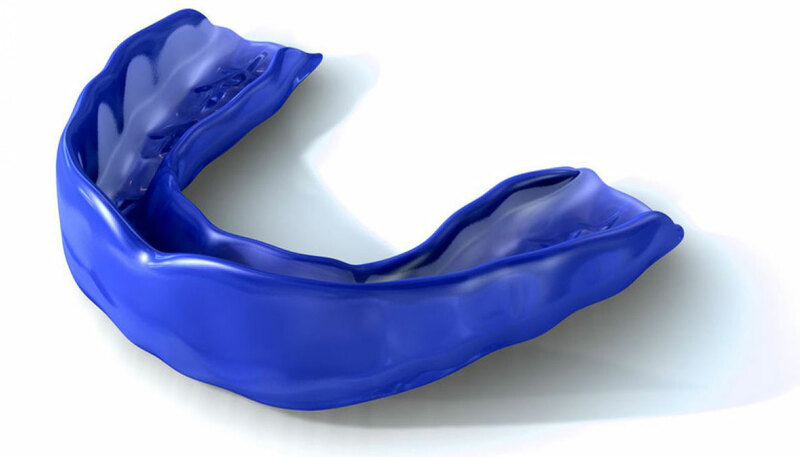 Because the stock mouthguards do not fit well, the player may not wear the mouthguard due to discomfort and irritation. The Academy of Sports Dentistry has stated that the stock mouthguard is unacceptable as an orofacial protective device. Custom-Made Mouth Protectors are superior of the other types and the most expensive to fabricate. But isn’t it worth the cost to protect your child’s teeth from injury? Most parents will spend quite a bit of money on shoes and gear, but might not think about protecting their child’s teeth. This mouthguard is made of thermoplastic polymer and fabricated over a model of the athlete’s dentition. The mouthguard is made by the dental office and fits exactly to the athlete’s mouth. The advantages include: fit, ease of speech, comfort, and retention. By wearing a protective mouthguard, the incidence of a concussion by a blow to the jaw is significantly reduced because the condyle is separated from the base of the skull by placing the mandible in a forward position.